Discussion in 'Jollies Bar' started by jkaratekings, Feb 2, 2019. I was on twitter and I saw a British Army tweet that said they have rolled out a new combat infantry course to Catterick. The tweet linked to this: http://viewer.zmags.com/publication/3c7c5b26#/3c7c5b26/30. The part on the new course is 3 pages. If the image doesn't work, it says 'Available to female Infanteers'. Now, I am someone who has always believed that if females meet the same requirements as males then its fine. 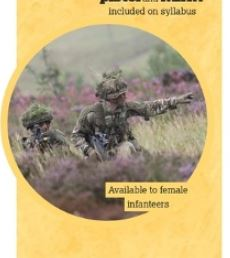 However, they have changed their infantry course just as females are allowed to join and have written that this new course is available to females in their booklet. It leads me to believe that the whole course was changed to make it so females can complete it. I mean after all these years, it happens to change just as females are allowed to do it? What do you think about what is written about the new course? Is it better for the army and will produce better soldiers and just a coincidence that it is introduced just as women are allowed to join the infantry? Or is the new course worse for the army and just further showing that standards are dropping? This is, at the best of times, a contentious subject and however it is approached, you can be sure you'll upset someone. Firstly, apart from the odd no-hoper, I've yet to meet a viable applicant that thinks standards should be lowered and diminish operational capability. There are however individuals who believe the way training standards are measured, do not stand up to modern scrutiny, regardless of gender. Equally there are people that believe the level at which the tried and tested training standards are set are strictly relevant to the requirement to achieve the same level of combat effectiveness. Trouble is, the timing of a review of training standards could not come at a more contentious moment in history. We know selection standards (not training standards) over recent decades were subject to "excellence creep". The logic being that the higher the bar for entry, the less the training risk and greater the success rate. Trouble is, it reached and exceeded the point were training wastage was reduced by pre-conditioning. The argument surrounding fitness for purpose will continue to rage, no doubt. Have lives been lost previously through lack of fitness? Again a contentious issue but if we look at the British losses at Fitzroy and Bluff Cove (Falklands), it was a combination of poor decisions but the decision makers would argue the decisions made were due to a series of tactical blunders centered around real or imagined lowered levels of combat fitness. This is all getting a bit boring now. Have you any evidence that standards have been lowered? If not, you are part of the problem surrounding women joining. Endless speculation about a perceived lowering of standards with no proof. Show me some evidence and I will join in with the outrage. We know selection standards (not training standards) over recent decades were subject to "excellence creep". The logic being that the higher the bar for entry, the less the training risk and greater the success rate. Interestingly none of the men of the Parachute Regiment who fought across the Falkland Islands passed a PRAC prior to Recruit Training because it didn't exist. As far as I'm aware the Royal Marines did not run PRMCs back in the day either. Would anyone seriously argue that their achievement—along with that of the other services—be demoted because the personnel of 1982 were notionally of a lower standard than in 2019? But back on topic... I'll reserve personal judgment until as stated above there is hard, factual evidence based on, say, two years of female candidates completing PRAC and PRMC. Fully agree. Lots & lots of rumours, usually generated by younger, less experienced trained ranks or people who have yet to join who assume only a bloke could do the job, with no first hand experience or evidence. None of the allegations appear to have stacked up yet. The only potential whiff of a "double standard" heard recently was the one that wasn't allowed to happen on an infantry SNCOs career course. Not seen or heard of those times previously and neither do I feel it necessary to explain the differences between "fit for task" rather than physical ability, nor how relative levels of fitness to do a job are measured. As I'm sure most people are aware, not all military jobs involve closing with and killing an enemy through brute force with one's bare hands - that's why we can afford to have wider age & fitness parameters when it comes to going to war in an air-conditioned ship with hot & cold showers, chef-prepared meals, whilst sleeping on sprung mattresses with feather pillows, duvets, a sweet shop, duty free fags, fire & forget missiles, yadda, yadda. I was asking other people. I obviously have no evidence and was seeing what others think of the Army’s new course. Do we have any direct comparisons available on which to comment? Unless I’m misunderstanding this thread it seems that an assumption is being made based on the caption attached to an image contained in the sidebar of a page of Soldier magazine. The caption is factually accurate as currently serving female personnel may now attend that course. Direct entry female civilians will be able to attend later this year. The OP’s images are a snapshot of a feature in the February 2019 edition of Soldier magazine. The entire magazine is available to read at the link below. Also worth reading is the statement by Major Richard Jeffery on page 12 of the magazine as he addresses the specific matter of training female infanteers. Having now read through Soldier magazine I cannot find any evidence that standards have been lowered. Training evolves. Parachute Regiment Recruits now wear head protection during the milling event of P-Company selection. A drop in standards since my day? No, a sensible safety precaution in my opinion. Until evidence becomes apparent that standards have been adjusted, dropped or ‘harmonised’ to make such courses ‘easier’ for female personnel I'll keep an open mind. An observation: anyone seriously considering a service career should perhaps focus on surpassing selection criteria themselves rather than worrying too much about the theoretical performance of others, be they male or female. It says in the Government Report that standards will be reviewed and changed to be “gender neutral”. Experience speaks volumes and considering the state of the Public Services, the previous statements and evidence shared on this forum before, that to assume changes, is sensible and very real. Gender Neutral is code for reduction of standard. Next mid scale conflict will be interesting. I've never understood the term gender neutral. Is a pushup not gender neutral? You either have the strength to do it, or you don't. Same with a CFT, you're either fit enough or you're not. Gender does not feature. Get that and agree to a point, but change in the military is the only constant. By flagging up every change as a threat to standards caused by women in close combat causes 'outrage fatigue'. This leads to people being much less likely to listen where there is a clear and measurable change. But if the hierarchy listened to the lads, and stopped mugging them off, and actually took an interest in the blokes they have a duty of care for, instead of worrying about politics and their careers. Then lads wouldn’t always kick off in social media, forums, within the grots and morale wouldn’t be in the toilet. Again I agree to a point, but constant outrage against a non-story does not help. This forum may be in danger of morphing into the Daily Mail where everyone is outraged against everything! Pick your battles and back it up with fact is all I am saying. It’s not a non-story though. They should be referred to as soldiers/infanteers regardless of gender. Instead of a political statement of constantly referring to women as female infanteers which will victimise and ostracise them from the get go. It’s already proven with the Army support units, and the public services that standards get lowered, in the interest of “gender neutrality”. And for the hierarchy to turn around and bare faced lie to our face about it not being a recruitment and retention issue speaks volumes. We could go back and forth on this all day. The BFT/CFT times for those serving in Army support Units have not lowered in the 26 years I have been serving. As for the new infantry course, I am not aware of a drop in standards in any part of the course but am not an expert. I am trying to think I of an example where standards have been lowered in any of the military to accommodate women; even the new CFT for combat arms is considerably harder than the old one. I am sure there are examples out there, I just can't think I of any. But they have separate times for men and women, there’s no drop now, because there’s no data or failure rate yet. If they can lower the standards and doctor the failure rate, it makes them look better, plus gets more blokes in. Police service, joke of a recruitment fitness test and lack of ongoing fitness assessments through their careers. Ambulance Service, joke of a recruitment fitness test and lack of ongoing fitness assessments through their careers. Fire Service, although they claim to have a “gender neutral” fitness test where men and women must score equal, they lowered the overall score to doctor the failure rate. As ongoing fitness assessments are an embarrassment. All which have come into effect since taking on the “equality” attitude and the drive to get more women in the job. We have seen it on this forum of numerous police articles of female police officers taking legal action against their force for discrimination.